The best wines in the world show well even in poor vintages, and 2008 was cold and rainy in the Northern Rhone throughout much of the summer. This wine from the iconic E.Guigal lacks the concentration and depth you expect from this producer but it makes up for it with cool weather crispness, bright red fruit, intense floral notes and a distinctive background wash of rainforest mist, a soft, filigreed, green-laced mineral note that I don’t think I’ve encountered before. In the right hands, these subtleties come out to play when the sun stays home. After a three-hour decant, the wine opened with bright, red cherry although the fruit darkens as it sits in the glass. Hints of chocolate, black olive, and roasted herbs fill out the pretty flavor profile. At first it revealed only brief hints of the barbecued meat character of more robust vintages, although with lots of air some smoke began to emerge. On the palate a seam of juicy fruit supports a taut line of soft acidity blooming coldly as it traces the wine’s considerable length. Its relatively slender, medium body has a texture more like silk than velvet. The early onset tannins are exquisite, meandering quietly through the gorgeous, endless finish. Elegant and stylish, the energy is relaxed and graceful, unhurried yet bursting with good cheer. A wine like this cries out for Miles witnessing the Birth of the Cool, especially the warm, inviting Boplicity with its shifting tonal colors which match the polished ebb and flow of the wine. It has just entered its drinking window and shows great integration and balance with only a hint of dried fruit on the finish. It will gain complexity with a bit more time but it drinks well now. I would not hold on to this for the long term as it seemed quite advanced on day 2. 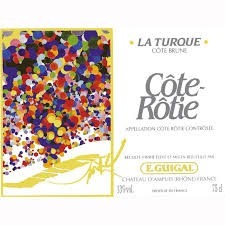 Technical Notes: Guigal is the benchmark for Cote Rotie wines and produces about 40% of the wine coming out of the region. La Turque is a small vineyard with southern exposure on the steep slopes overlooking the village of Ampuis. It’s planted with 93% Syrah and 7% Viognier which is included in the blend. Fermented in stainless steel tanks and macerated for four weeks, the wine is then aged for 42 months in new French casks. Guaranteed, you won’t hate this wine. It’s hard to hate something so precisely manufactured, perfectly coiffed, with no rough edges, and brimming with the typical flavors of commercial wine. Black cherry, pepper, and a background layer of vanilla-inflected oak supply the aromatics with a bit of dust to remind you grapes come from the earth. On the palate it’s quite lush, round and full showing berry and milk chocolate upfront and a blend of cinnamon and pronounced white pepper on the medium length finish. Speaking of the finish, this is where many less expensive wines fail. Not so here. The wine is quite linear until the finish reveals a nice, acid-driven crescendo with some elegance and finesse over soft tannins. Surely a crowd pleaser, stylish and agreeable but emotionally flat until the lyrical finish. Pair with Hall and Oates’ I Can’t Go for That for an evening of anodyne cheerfulness. 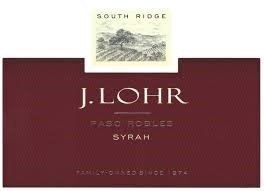 Winery and Technical Notes: J. Lohr is a large producer making over 1.5 cases annually yet is still family owned and operated since 1972 and has long been noted for their sustainability practices. This wine is aged in American and French oak barrels, 20% new. Central Coast Group Project is Scott Sampler, a former philosophy student and Hollywood screenwriter, who produces around 1000 cases annually in an industrial park in Buellton. He practices the dark art of uber-long macerations. This Syrah was on the skins for 101 days. The result is a luxurious blend of power and tenderness, a wine so intense and intimate it was like falling in love all over again. I’m really too old for this stuff. The name of the wine is a clever amalgam of Star Trek’s Captain Kirk, and Danish philosopher Soren Kierkegaard (who called himself the Knight of Faith and loved to take long walks). If you’re curious about how all of this hangs together, well you just have to drink the wine. All will be revealed. Here is my full review of the wine. This is some of the most inspired winemaking I’ve come across—the whole lineup of several Syrah clones, Bordeaux varietals, Grenache, Mourvedre and a variety of blends is interesting and delicious. I have never tasted a wine like this. 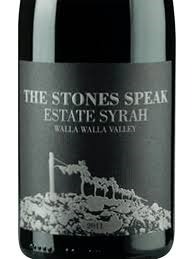 But then I say that about every wine I taste sourced from The Rocks AVA, a relatively new AVA on the Oregon side of the Columbia River just south of Walla Walla Washington. The Rocks District bills themselves as one of the most distinctive AVA’s in the world, and I think, for once the marketing is accurate. The wines show astounding minerality. An errant swarm of aromas, briny green olive, barnyard, crushed rock, and floral notes surround dark berry, an intense, heady mélange that signals worlds colliding and new ones being formed. The palate features a gloriously long, linear midsection of succulent, earth-toned, juiciness that slowly loses heft as it evolves into an ethereal cloud of black licorice. Finally, at risk of fading, the wine re- launches with a pointed, laser-like finish, an angular, electric charge that carries a citric and mineral note. The tannins are fingers of smooth mastery, the acidity settles in gently, yet the finish bursts like imprisoned lightning. An evolution like none other, this wine is deliciously strange. A wine of pent-up tension and latent revelation, perhaps apocalyptic since it meshed well with TV on the Radio’s DLZ. Story and technical details: Saviah is an award winning winery named as one of the top 100 wineries by Wine and Spirits Magazine in 2010. Grapes were harvested from the Funk Estate Vineyard. Aged for 12 months in French oak puncheons, 20% new. This is a lovely wine from this Woodinville, Washington based winery. Sourced from the very warm vineyards on Red Mountain, there is lots of fruit power here but wrapped in a cloak of polished, graphite minerality and burnished acidity that give this wine remarkable elegance. 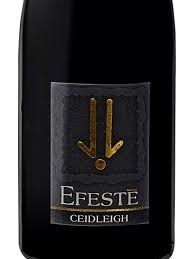 The expressive nose shows prominent roasted meat aromas upon opening but the smoke backs off a bit after aeration to reveal dark berries, black olive, sage and mocha with hints of violet. Despite the dark demeanor, it’s playful and vibrant on the plate, luscious without being dense, focused, with sustained purity of fruit even as the tannins and acidity gather strength. Medium bodied and deftly oaked, the wine moves across the palate at a generous pace undergoing several subtle gradations of smooth. The tannins enter the stage gradually, seamlessly merging with the acidity to execute a heady climax before finishing with insouciant elan, graceful to the very end with a very soft, gentle finish. More cerebral than passionate, refined but charismatic, with a pace and rhythm well matched to Steely Dan’s Glamour Profession. Technical Notes: Sourced from mostly estate vineyards, aged in French barrique and puncheons. There are big changes afoot at Randall Grahm’s iconic Bonny Doon Winery with the highly experimental Popelouchum Vineyard nearly ready to begin producing. New varietals, rediscovered ancient varietals, and new techniques for expressing terroir will soon have the wine world abuzz. But as we look forward to the future we can treasure the past. 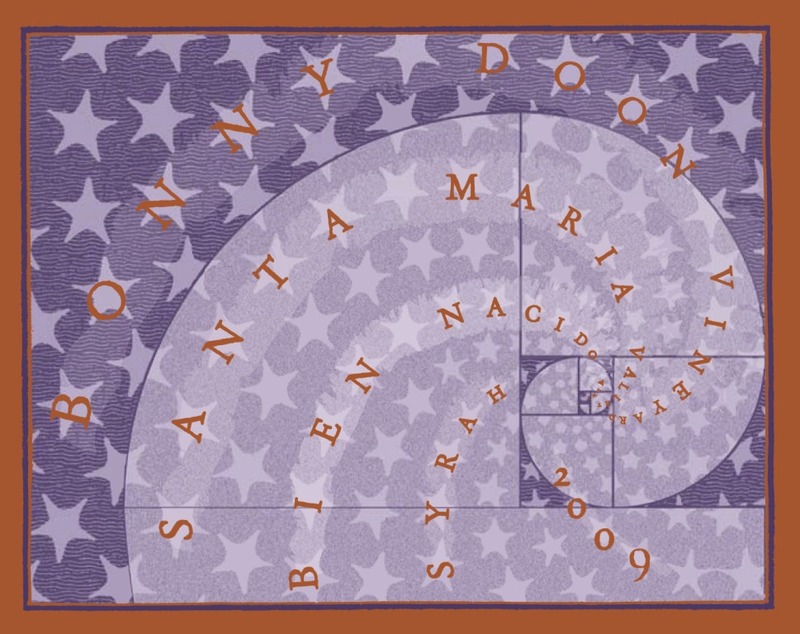 Bien Nacido is a historic vineyard in Santa Maria Valley with the distinction of being the first cool climate vineyard in the U.S. to plant Syrah. Who better to make wine from these grapes than Grahm, one of the original Rhone Rangers who helped put American Rhone varietals on the wine map. Bold, forceful aromas, more demonic than pretty, are themselves worth the price of admission. Rich, smoked meat with mint highlights, fresh dark berry and a spice note I couldn’t nail down—the warmth of clove but more herbal—mark this wine as distinctive from the first whiff. The medium-bodied palate opens with pure juice, followed by an expansive seam of minerality, which then condenses becoming dusty with flavors of tart, dried berries. A luscious, peppery burst of fresh fruit returns to launch a finish that fades to distinct cranberry notes at terminus. A dance between freshness and desiccation marks this wine at this stage of life, revealing and concealing, coy about disclosing an essence. Brisk and insistent as it evolves on the palate, texture changes create a sense of friction, competing forces in tension, holding each other in check like cool water swelling against parched sand. Tannins and acidity are so harmonically entangled that you really can’t pry them apart analytically. There is still plenty of life left in this wine 9 years after vintage. 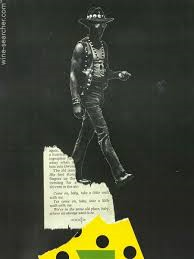 Exuberant in its austerity, with a heart that blooms coldly, its motion the kind of strident intensity well captured by Springsteen’s Born to Run. The word “ecstasy” often means joyful excitement but there is an older use of the term more directly related to its origins in the Greek word “ekstasis” which means to stand outside oneself in a trancelike state. This wine is quiet ecstasy, tender but uplifting, too spirited to be serene yet perfectly composed as if nothing could disturb it. Aromas of blueberry, cumin, dusty earth, old books, and especially crushed rock meld together in tight formation. The palate is fresh and vibrant with a red berry component, yet all rough edges have been ground away leaving a ravishing elegance. The lush opening survives as a cashmere-like softness in the tannins that persists as a seam of minerality slowly takes flight, pushed by glowing acidity that never bites becoming pointed and high toned on the finish. That minerality becomes the wines’ leitmotif—as if a rock could caress. The relatively low alcohol, and vibrant acidity make the case that wines of restraint and balance age best. This is lovely old world winemaking in the new world. Pairs with music that has a lyrical sensuality, quietly joyful, such as Ravel’s Sonatine rendered here by Kun-Woo Paik. Those of us who love aged wines sometimes feel like we face an extinction event. Well over 90% of the wine purchased in the U.S. is consumed within 24 hours of purchase and it is estimated that 99% of our annual production is intended to be consumed with 5 years. Yet, as I travel about the country visiting wineries I occasionally fine kindred souls who make wine intended to age and will not release a bottle until it’s drinking near its peak. 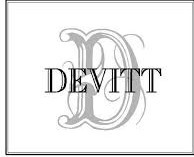 Devitt Winery in Southern Oregon’s Applegate Valley is one such winery. A labor of love producing 800-1200 cases of small lot wine annually, from mostly estate grapes, the winery was started by former Napa producer Jim Devitt in 2003 as a way of salvaging excess grapes. Today the winemaking is done by grandson Brendon who took us through the tasting starting with their recently released, textured Viognier, an outstanding rich, almost buttery Rosato, a big, spicy field blend, and a Pinot Noir. But the stars of the show were the several Bordeaux varietals and Syrah from 2005-2009. Especially this Syrah which saw 9 1/2 years of barrel aging before release. The expressive nose is a kaleidoscope of constantly changing aromas– cigar box, mint, dried cherry, coriander, caramel and sweet oak. These are gorgeous , rich, deep, focused aromas. On the palate the dried cherry note is persistent delicately weaving a mouthwatering line knitting the wine together. Soft, spare and elegant upfront, the fruit power fades into a rush of swelling, lively acidity that develops citrus notes on the finish that preside over reticent tannins. “With an eye made quiet by the power of harmony and the deep power of joy we see into the life of things”, wrote the poet Wordsworth. Power seems to rule the world but it can accomplish nothing without equipoise and affinity, the harmony of good taste writ large. From my favorite winery in one of my favorite wine regions comes this new release that will likely not bring harmony to the universe but can instruct us in what harmony is. All the elements so gently speak to each other, I thought I was in church although that feeling quickly passed. Dried cherry is prominent with hints of anise, milk chocolate and faint crushed rock in the background. With lovely roundness and purity of fruit, the complexity at this point is just beginning to emerge, and if past vintages are an indicator will develop some of the character of a forest floor in autumn with a few more months in the bottle. It is on the palate where this wine earns its Wordsworth quote. It’s round and dense upfront yet softly textured even as the tannins begin to swell. A seam of minerality enters midpalate lifting the wine as it murmurs of sweet oak. The tannins are a revelation, fine grained and seemingly gentle but with great presence, caressing but with undertow, gathering its energy via a slowly rising tide of tactile sensations that patiently adds firmness becoming more pointed and angular at terminus. The years in barrel have been very kind to this estate wine, and are an indicator of the patience and care with which it is made. Harmony without effort calm and dignified yet amiable this wine will quiet any storm brewing in the heart. Sip while unraveling Jan Garbarek’s A Knot of Time and Place.